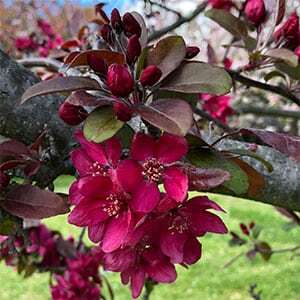 A Crabapple with deep red flowers, Malus ‘Profusion’ is a naturally small growing deciduous tree to around 4 metres in height. It has a natural spreading habit and makes a good small shade tree as well as a showy feature tree when in flower. It does live up to its its name, with masses of red flowers in spring. New foliage has a coppery tinge before turning to a good green, foliage is rounded and attractive through the season. The flowers are followed by small deep crimson red crabapples. Best grown in a sunny position in a well drained humus rich soil. Dig the soil over well, weeding the area well. Dig a hole the depth of the pot and twice as wide. Plant at the same depth the plant was in the container. Stake well to hold the plant firm. Mulch around the plant to maintain a cool root run and help prevent weeds. 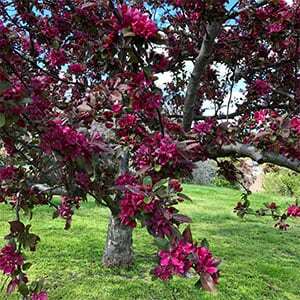 You can prune Crabapple trees immediately after the fruiting period is complete if you wish to shape the tree. It is not a tree that demands regular pruning, so maintenance is low. Height – To around 3 – 4 metres.